Cadets from the Hickory Composite Squadron were presented with milestone awards at a squadron meeting on Tuesday, 27 November 2018. 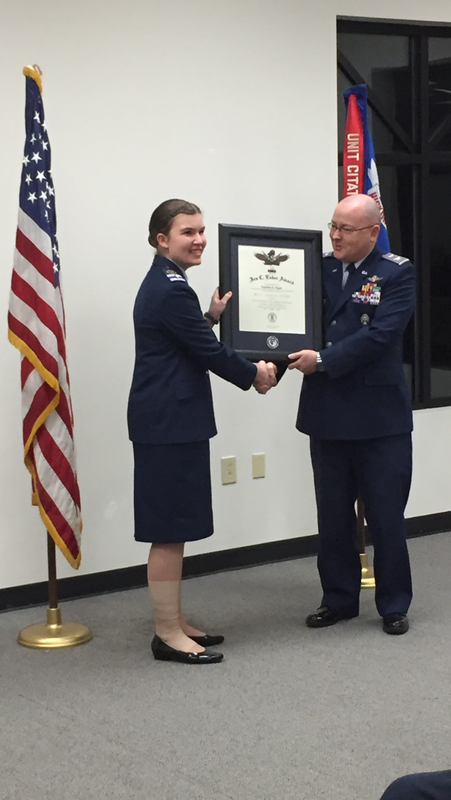 Cadet Lieutenant Colonel Madeline Nagele was presented the Ira C. Eaker Award by Col Michael Moyer, Vice Commander of the Middle East Region. In his remarks, Col Moyer praised the cadet program of Civil Air Patrol (CAP) for producing outstanding young leaders. He also underscored the importance of local squadrons to the three missions of CAP. Colonel Moyer also pointed out how few cadets ever earn the Eaker award, and praised C/Lt Col Nagele as an example to the cadets of her squadron. Cadet Lieutenant Colonel Nagele is a recent high school graduate and is studying nursing. Cadet Lieutenants Micah Randolph and Savannah VanGundy were awarded their Billy Mitchell Awards by Maj Jim Fitzpatrick, Group 1 Commander. Cadets Randolph and VanGundy are the third and fourth cadets in the Hickory Composite Squadron to earn the Mitchell Award in 2018.